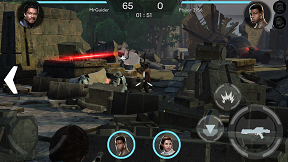 Stars Wars Rivals is an action-packed shooting game for Android by Disney, in the game, the player builds a team of heroes, fight against other players in real-time, take part in guild events, and improve the stats of the whole team. The game features PvP and guild mode, amazing arenas, outstanding graphics, and much more. Let’s take a look at all the things of Star Wars Rivals game. Star Wars Rivals game starts with a tutorial in which you learn about the basic of the game; controls, how to shoot, how to move, and more. Once the tutorial ends, the player starts the game from league 1 and progress in the game by getting victories in highly action-packed battles. The tutorial is not so great in comparison to the real gameplay, I was going to uninstall it because of the tutorial, thank god! I did not uninstall it, because, after the tutorial, the real action starts in Star Wars Rivals, one of the best shooting games. It features real-time PvP battles and guild events. There is no energy system in this game, that’s really great. You can play as much as you want to play. Once you reach the level two(your profile), you can join the guild and take part in events. Before the battle begins, the player selects the top three heroes for the fight and choose the troops. After it, the battle begins, and the team who earns more point in limited time get the victory. To earn points, the player shoots down opponents using heroes’ skills, gun. You can control only one hero at a time & switch to another anytime. Star Wars Rivals has amazing graphics, fully action-packed gameplay where both the team has only one goal; defeat rivals and get the victory. It would not be easy, victory depends on your skills, strategy, heroes’ strength. Amazing, well-designed environments are featured in Star Wars Rivals where you battle against other players in real-time. Credits – Used to purchase items; ability points, data tapes. Also in ranking-up. Crates – A treasury box that contains data tapes, credits, heroes’ fragments, and much more. You can get these crates by getting victories, as a reward. Or purchase with real money. Star Wars Rivals is a free action-packed shooting game, the player can buy valuable resources by paying some bucks. The monetization starts from $4.99 and goes up to $99.99. You can buy crystals, heroes, credits in exchange for real money. If you are a beginner and don’t know too much about Star Wars rival game, then this guide will help you as an ultimate game tutorial. On the main screen, tap on the battle and the player has to choose three heroes and troops. Select higher level heroes according to their abilities, head back to heroes section and there you can get information about their skills. Next thing is to choose troops, troops help you in battle and increase the chances of getting the victory(if you choose right one). Select troops; for instance, First Order Stormtroopers has the ability of long-range weapons, Rebel Infantry support medics, tap on a troop to select & deselect. I would recommend you to go with First Order Stormtroopers. Tap on the find battle and wait for the opponent and let the battle begins. Star Wars Rivals is a shooting game and if you don’t know about controls, then it would be hard to get the victory. Hold down your thumb on the left side screen to adjust the camera, to aim, to change the view. On the right side of the screen, there are many buttons; rounded one is for fire, down button lets you hide from enemies(like a defense, not completely), use skill button to use the ability of your hero, make sure to target the enemy first before you use the skill. In Star Wars Rivals game, you play as heroes, to get the victory, you need to rank-up, level-up your hero. To level up your hero in Star Wars Rivals, you need XPs. XPs can be earned by fighting in battles. To Rank-Up your hero, you need data tapes. Data tapes can be collected from various sources; battles, crates, rewards, guild events. Every hero has five different abilities; weapon, health, active, passive, and team. Every ability has a level, which is improved by ability points. Increasing a level makes that ability more powerful and improve the hero stats. Star Wars Rivals is a multiplayer shooting game, you fight against other players from all over the world, it would not be easy if you don’t know much about the game. Read the tips, cheats & strategies for Star Wars Rivals and defeat the enemy troops and heroes like a pro! The very first task in Star Wars Rivals is the selection of heroes. You may have dozens of dozens of heroes, but you have to choose the best three out of all available. Now the question is who are your best heroes? If you are a beginner, then you need to increase the power of heroes. How to increase the power of heroes? Power can be increased by leveling up, ranking up, and by increasing the level of abilities. How to Level Up? You need XPs, XPs can be earned by getting victories in the battles. Once you complete the minimum requirements of XPs for a hero, his/her level will increase. This will benefit only those heroes who were selected by you for battles. To rank-up heroes in Star Wars Rivals, you need data tapes. Data tapes can be collected from the store, from the crates, as a reward. The process is similar for all the heroes. To increase the level of abilities, you need ability points. These points can be purchased from the store in exchange for credits. Each hero has five types of abilities; weapon, health, active, passive, and team. Increase the level of skills/abilities of heroes and increase the chance of getting hurt in battles and getting the victory. ⇒ Rank Up+Leve Up+Skill Level-Up=Power Increase. The second step in Star Wars Rivals is the selection of troops. The player can select one troop, each troop has its own role. For instance: Bespin Wing Guard defeat the enemy troops and heroes by throwing thermal detonators, First Order Stormtroopers has the ability to shoot down enemy troops and heroes from a long range, Jakku Pirates support medics. Now the question is which troop is best? The player controls only heroes, troops do their work automatically, selecting the troop that helps you to defeat the enemy increases the chance of winning, because you need points to win the battle and points can be earned by defeating troops and heroes. So go with Bespin Wing Guard, First Order Stormtroopers. It’s easy to get the victory in Star Wars Rivals even if you have low power in comparison to the opponent. You need the maximum points for the victory, just find the enemy hero(not troop) and slay down him/her using skill and bullets. If you defeat the hero, you will get 25 points, but if you defeat troops, then you will get only 5 points. So always target hero in Star Wars Rivals. You can’t win if you are not increasing the power of hero, as mentioned above, you need game currency-data tapes, ability points, XPs to increase the power of the hero. So how do you get data tapes, ability points, credits for free? Join the guild and take part in it, you can win data tapes, credits on the basis of event rewards. If other members are not taking part, leave that guild, and join another. Common Crate, Battle Crate, Free Crate, And Rare Crate can be collected for free. The common crate can be earned by getting victories in the battle. The battle crate requires medals, once you complete the threshold, you can open the crate. The rare crate requires crate materials, can be earned by completing achievements. You can keep track of threshold, just head to store section, then crates, scroll right and there you can see the rare crate. Head to the rank ladder(on the main screen, tap on current rank option), there you can see your position. You will be rewarded as per your points. Be on the top and get more reward than others. So these are the top best tips & cheats, strategies for Star Wars Rivals game. 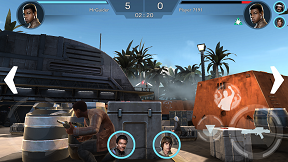 Star Wars Rivals is an amazing action-packed shooting game for Android & iOS. Disney’s this game would be super hit because of amazing graphics and gameplay. You can download Star Wars Rivals for Android – here(Google Play Store). You can also download the Star Wars Rivals APK from APKPure website(Beta).